Sometimes Philadelphia feels like a PSA masquerading as a movie. Ron Nyswaner’s Oscar-nominated screenplay has moments that are simply cringe-worthy. We must remember the film came out two decades ago. In 1993, discrimination against homosexuals was considerably more acceptable than it is today. Also in ’93, HIV/AIDS was approaching a peak in terms of mortality rate and new reported cases. While each of these issues remains extremely important in 2013, public awareness and attitudes have change to a great degree. Perhaps Jonathan Demme’s film had a hand in that. It’s now available on Blu-ray from Twilight Time as a limited (to 3,000 copies) edition. Revisiting the film for the first time in 20 years, I found it to be even more emotionally involving than I did as a younger viewer. Yes, some of it feels quite dated. 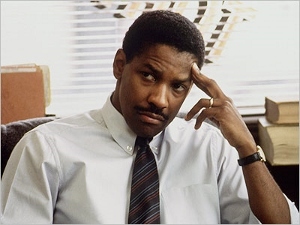 The idea that large numbers of people assume attorney Joe Miller (Denzel Washington) is gay (or “turning gay”) simply because he is defending a gay client, Andrew Beckett (Tom Hanks), seems harder to swallow these days. The partners in the law firm that wrongfully terminated their employment of Andrew, led by Charles Wheeler (Jason Robards), are thinly written as one-dimensional villains. The overly chaste portrayal of Andrew’s relationship with his partner Miguel Alvarez (Antonion Banderas) is also a remnant of an era when this type of story was harder to put across to mainstream audiences. They come across more like brothers than a romantic couple (even considering Andrew’s physical involvement is limited by grave necessity given the status of his illness). Yet my cynical view of Philadelphia as being nothing more than a finger-wagging sermon aimed at people less open-minded and accepting than myself really turned out to be seriously distorted by the passage of time. Life experience accumulated over 20 years of adulthood, including witnessing people waste away from terminal illness, has changed me as a person. While it’s easy to roll one’s eyes at some of the cheesier moments (Joe, a very high profile lawyer, totally losing his cool in front of everyone in a drug store when approached by a gay man), I found it harder than ever not to be swept up in the overwhelming sadness of the film. While I once thought the inevitable conclusion (mild spoiler alert) that finds Andrew finally succumbing to the ravages of AIDS was hopelessly manipulative, I now find it extremely poignant. I was also struck by how much a two-man show Philadelphia really is. 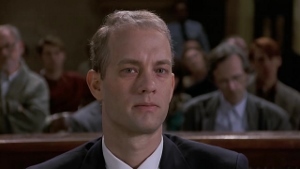 Tom Hanks turns in fine work as the lawyer ostensibly fired for not having disclosed his illness. He famously won his first of two back-to-back Oscars. Frankly, he didn’t deserve it – not with the likes of Liam Neeson in Schindler’s List and Daniel Day-Lewis in In the Name of the Father as competition. But it was a bold move for a star of Hanks’ stature to take on this role and he was duly rewarded. What I had forgotten was just how great Washington is as the emotionally conflicted, deeply homophobic lawyer who bravely rises to the occasion. In fact, in addition to elevating AIDS awareness and promoting acceptance of non-heterosexuals, Philadelphia is the story of two men summoning the courage to stand for what they believe in, regardless of how potentially embarrassing it may be for either man. Twilight Time’s Blu-ray presentation offers a natural, filmic image. The transfer is quite clean and carries a consistent level of natural, fine grain. The color palette was muted to begin with, so nothing exactly pops from the screen. Tak Fujimoto’s cinematography was never intended to be colorfully showy in this case anyway. The DTS-HD MA 5.1 surround mix is similarly reserved, focused mainly on presented crystal clear, front-centered dialogue. Bruce Springsteen’s indelible “Streets of Philadelphia,” which plays over the film’s opening credits, sounds excellent. Extras include Howard Shore’s score as an isolated DTS-HD MA 2.0 track, deleted scenes, a couple of short featurettes, and audio commentary by director Demme and screenwriter Nyswaner. 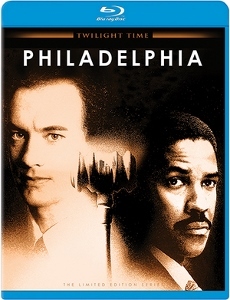 A lesser filmmaker than the great Jonathan Demme may have turned Philadelphia into a corny, clichéd hash. But despite a few arguably forced moments (I still don’t care for Andrew’s opera-listening scene – does it really convey any deeper level of anguish? ), this one remains powerful and worth revisiting. Get it on Blu-ray while you can by visiting Twilight Time’s exclusive distributor, Screen Archives.